It’d been years since Lisa Goodman-Helfand publicly shared a photograph of her bare face. Goodman-Helfand, 40, lives with scleroderma, an autoimmune disease that can cause skin disfiguration. As a result, her skin is covered in red blotches. 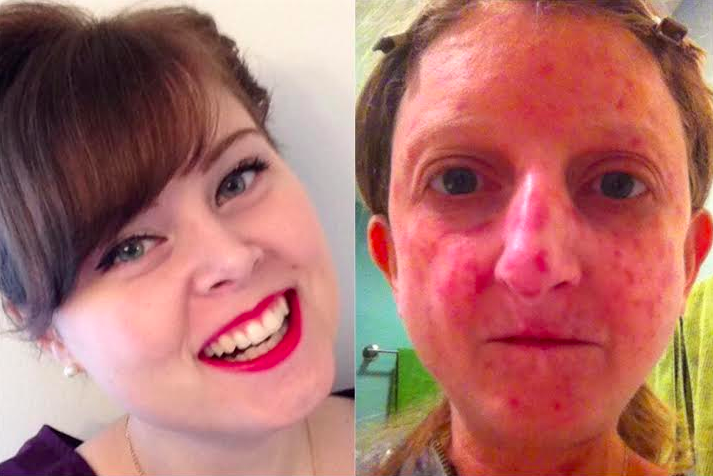 She always took care to conceal how her disease affected her looks — until she connected with Chanel White, another woman living with scleroderma. On July 22, Goodman-Helfand shared the photo below of her and White side by side in an article on her blog. She wanted to show others the variety of ways scleroderma manifests itself, and inspire people to broaden how they define beauty. Your ad wasn’t approved because it includes ‘before and after’ images, or other images showing unexpected or unlikely results. It’s also recommended that you avoid focusing on specific body parts, because these images typically receive high negative feedback. Goodman-Helfand responded, explaining that her photo was not a “before and after” image and asking if someone could please take another look at the article and explain why the ad wasn’t approved. A Facebook representative responded saying she’d looked at the ads and determined they “weren’t able to accept them because of the image used,” according to Goodman-Helfand. Thanks for reaching out to our team. It appears your ads were mistakenly disapproved, and we’ve re-reviewed and approved them. I’m sorry for any inconvenience this caused. However, even after Goodman-Helfand’s photo was cleared to run as an ad, she again received a rejection note from Facebook when she tried to place the same photo in an ad for the Yahoo article on July 29. She wrote back to Facebook asking why the photo was rejected once again, but says at this point, it’s not about the rejection anymore. Read Goodman-Helfand’s original post about having her ad rejected by Facebook here.